Designed for students and artists who need a firm, sturdy surface for sketching and a means to carry their sketching paper with them. 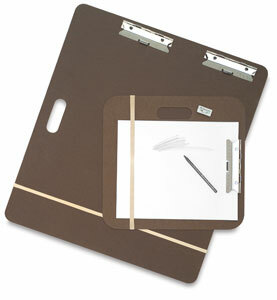 Two heavy clips on the large board (only one on the small) hold a sketch pad firmly in place, and, once a sketch is completed, the oversized rubber band holds the bottom in place while it is being transported. The board is made of 1/8" (3 mm) thick masonite and is very lightweight, with rounded corners for safety. A hand hole makes carrying easier. Replacement Large Rubber Band — Keep your artwork flat and secure with Tote Board Rubber Bands. Each rubber band measures 8" long and 7/8" wide, ideal for securing your artwork at both ends of the smaller drawing board.